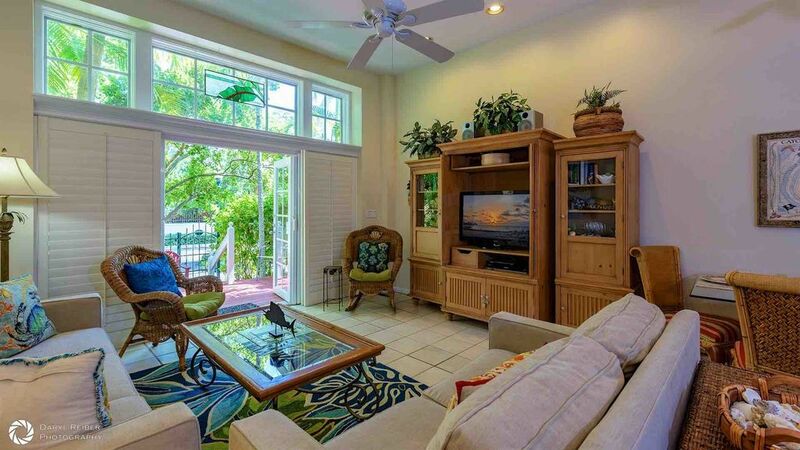 "Villa Bahama" is located at The Foundry in the Truman Annex, Key West's most exclusive gated community. You'll be just around the block from Mallory Square, Duval Street and all the attractions Key West has to offer, yet you'll benefit from the peace and quiet that the Truman Annex is known for. Smoking is not permitted in any Last Key Realty home. In addition, the Foundry does not permit smoking in the front garden patio areas or balconies. Therefore, this home is not a good fit for vacationers needing smoking accommodations. "Villa Bahama" has been furnished to a very high standard, in the lush tropical style inspired by Tommy Bahama. In fact, the Tommy Bahama influence is evident throughout this home. The living area is an open plan, with 11-foot ceilings, and the double French doors provide lots of light. There's plenty of comfortable seating and a flat screen TV. The sleep sofa will accommodate extra guests. There's convenient powder room on the first floor. The kitchen has a top-of-the-line stove, oven and refrigerator, with granite counter tops and all the small appliances one might need. You'll have your own private courtyard out front, with a gas BBQ. The landscaped community pool is just across the street, with chaises and a cabana with restrooms. Or you can walk to Fort Zachary Taylor State Park, with the prettiest beach in Key West, just a half mile away from your front door. >> Master Suite: Located on the Second Floor with a King bed, a large flat screen TV, a private balcony, a large closet, and an en-suite bathroom with a shower and tub combination. >> Second Bedroom: Located on the Third Floor with Two Twins OR One King bed, a flat screen TV, a closet, and an en-suite bathroom with a shower and tub combination. Each floor closes off with its own separate door as well for extra privacy. This townhome was everything I hoped for! Comfortable. Spotless. Quiet, gated community and close to everything. Nicely decorated. The rental company went over and above to be sure we enjoyed our stay. Loved the local artwork on the walls. Would stay there again. Greg and the staff at Last Key Resort we’re so accommodating! Everything we needed was available at our fingertips. We has a wonderful vacation in Key West! The owner of another condo double booked our stay and these nice folks helped us find a new place to stay and even picked us up from the front porch and took us to our new location! This place is very nice, clean and in a great location! Everything you need for a great stay is there for you. Keith was wonderful, greeted us with a big smile and a Key Lime Pie. He was there to get us settled in and show us where everything was stored, even gave is a tour to the pool. He helped us with picking the best places to eat and visit! The concierge service helped us find the best day trips and were there for any and all questions. We will stay again in the future! We were not ready to leave!! The property was great! It really has the Key West feel. There is a note on the thermostat to not set it below 70. My husband had trouble sleeping. He likes it cold at night. I also wish there were overhead lights in the bedrooms. I would still stay there again. Great location! My family and I had a wonderful time in Key West and Villa Bahama was the perfect place to stay. Truman Annex was within walking/biking distance to everything... Mallory Square, Duval, Fort Zachary Beach. The unit was clean and comfy and renting thru Last Key Realty was a pleasure. They were super responsive to any issues and their Concierge Service helped us with planning everything from bike rentals to sunset cruises. We will definitely be back! It’s in good shape, comfortable, great location. The concierge service did not return calls. You would be better to set up your own reservations and spa services.